Laurel Leader finds Lost Laurel… by way of Steward Manor! On Monday morning, I had the pleasure of meeting writer Kevin Rector and photographer Sarah Pastrana of the Laurel Leader. 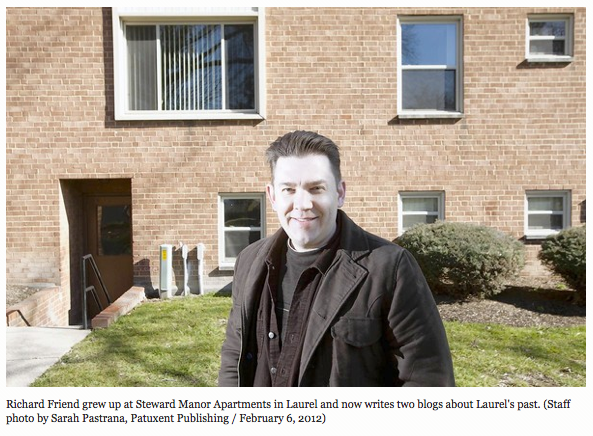 Just a few days earlier, Kevin made my day with a request to do a story for the paper about Lost Laurel and Steward Manor Days, and how these projects came to be. 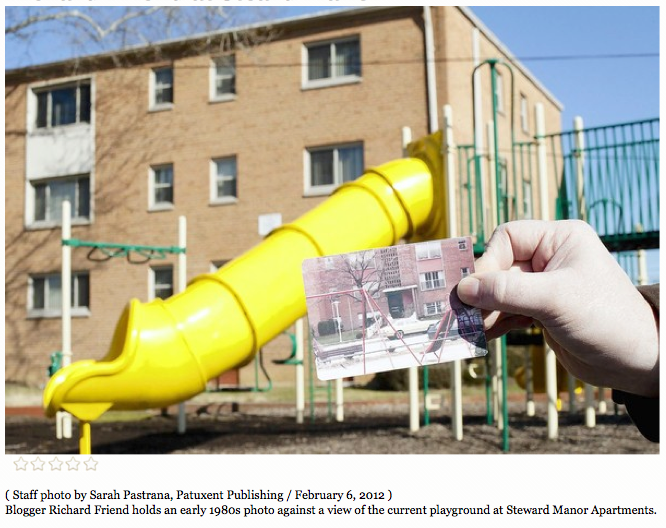 Naturally, he suggested we meet at Steward Manor, where Sarah took photos right behind my old building at 100 Bryan Court. See those second floor windows directly above me? From 1979–87, that was home to me. 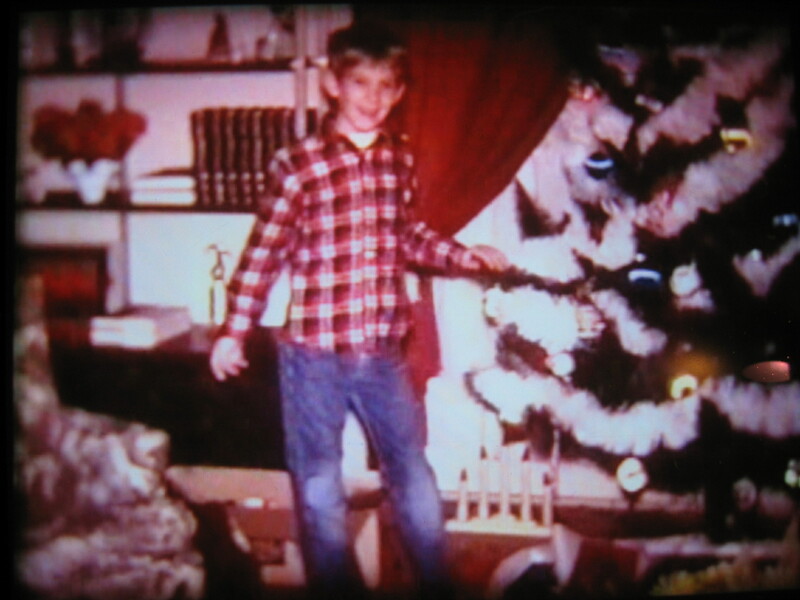 Just behind the largest window was our living room, where a total of eight Christmas trees stood throughout my happy childhood. And on the other side of the tall, single window to the right was our dining room. At that table, I did most of my homework between 2nd and 9th grades—frequently referencing the incomplete sets of second-hand encyclopedias on our ancient particleboard bookcase between said windows. This was Steward Manor in the 80s for me; my starting point for all those innumerable trips to the mall, to Zayre’s, to Dart Drug—and all the other long-lost places we’re now revisiting. As you can see from this old Super 8 home movie still, a happy kid lived on the other side of those windows, in spite of the modest surroundings. It’s safe to say, though, I never expected to be standing outside those windows some 30 years later, talking about it all with anyone from a newspaper, including the Laurel Leader. We spent a good 45 minutes in the old neighborhood, cutting through the building to walk up to the playground behind 106 Sharon Ct. Here, Sarah took another photo—this time with me holding a photo submitted by one of our Steward Manor Days Facebook fans. Oddly, it was probably the first chance I’ve had to really explain the premise behind both projects to anyone—aside from my immediate circle of friends and family. 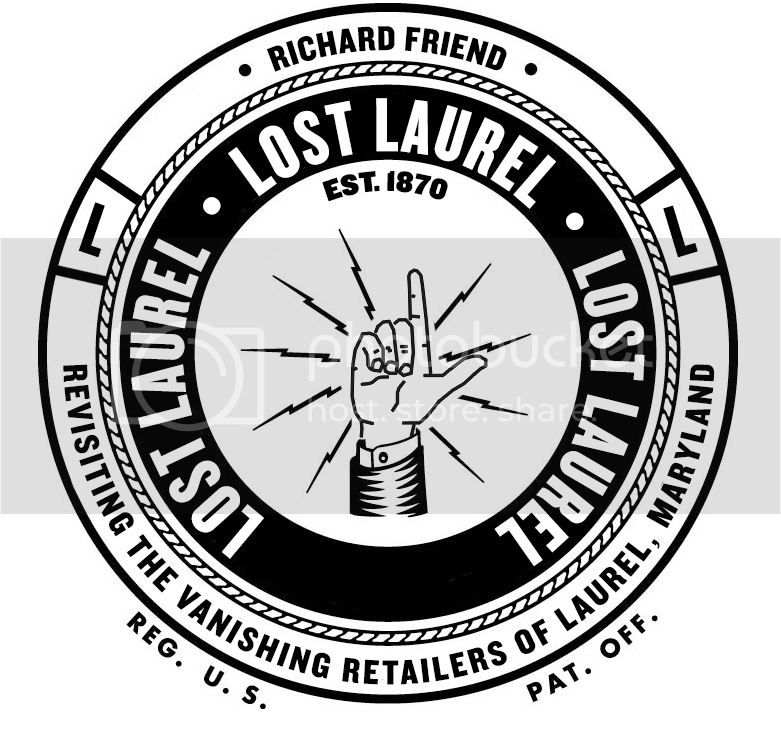 As the article makes clear, I’m still blown away that so many people share the sense of nostalgia I’ve developed for this old apartment complex—as well as the countless stores, restaurants, and other defunct establishments that make up “Lost Laurel”. And it’s an honor and a pleasure to shine a long-overdue light on both. So yesterday was an absolute blast—not only walking through Steward Manor again for an article in the Laurel Leader, but finding the story on their website before the end of the day! Wow—news travels (and gets written) fast! I want to give another big thanks to Kevin and Sarah for making the trip and for sharing the story this way. Now, even more people will be able to find Lost Laurel. In the spirit of the blog, this post wouldn’t be complete without something to tie Steward Manor and the Laurel Leader together nicely, with a big red bow on top. 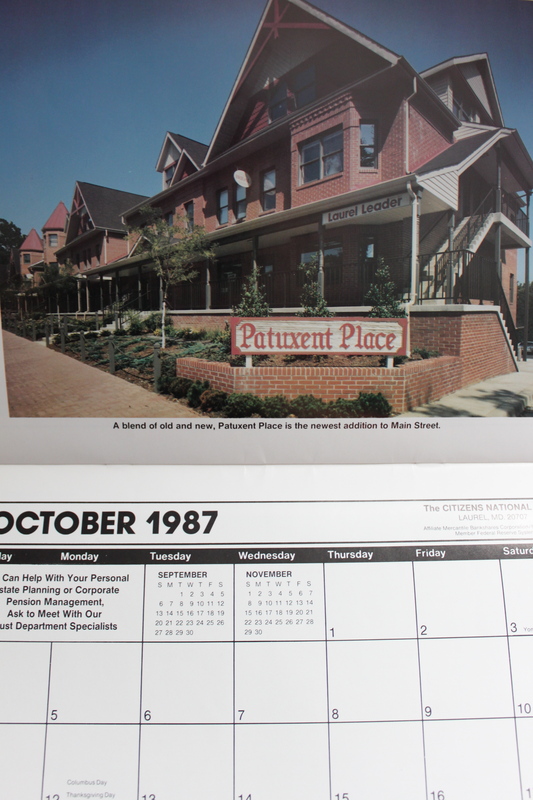 It just so happens that Mrs. Tina Pressley—the mom of two of my oldest and closest friends from Steward Manor—recently unearthed an old courtesy calendar from Citizens National Bank on Main Street. There, on the October 1987 spread, is a great shot of what was at the time the Laurel Leader‘s new offices at Patuxent Place. 1987, incidentally, was my last year at Steward Manor. Read the complete article at LaurelLeader.com. Hello Richard! I used to work with your father, Al Friend, at an electrical supply company in D.C. We used to ride together to work and I remember when we had to do the yearly inventory one year that paid double-time, your dad was going to buy you a video game with the overtime pay. This was around 1981 or 82 or 83. I also know Jutta Heidelberger; I lived next door to her in Maryland City on Brock Bridge Road and she drove this car, I think it was a Chrysler with the “Suicide Doors”. Wow! A total flood of great memories from your website. Now that you mention it, I also seem to remember Mrs. Heidelberger driving that Chrysler! We’re planning another “Steward Manor Reunion” next month, so hopefully I’ll see her and ask about it. She’s still there managing the complex; she and her staff are probably the only reason the place is still standing—they do an amazing job, and always have. Cool! I’m glad to hear you’re mom and dad are doing good. Let me know when the reunion is. It would be nice to attend. Just let me know when the reunion will be. It is Summer and I have to be quick on the leave time calendar. Looks like we’ve finally settled on a date for the next Steward Manor get-together—Saturday, August 4th, starting at noon. I’ll try to get my folks to drop by, too!